Disclaimer - I’m neither a doctor nor a nutritionist. Please read this article below with an open mind and do your research before making any change. If you are born in the 80s, you would have come across this ad in Doordarshan - a woman with shabby hair would crib about how messy it is to fill lumpy salt in the bottle and then a woman wearing a crisp, white saree and neatly combed hair would cut open a pack of iodised salt and pour it effortlessly into a bottle. The salt would come out in a smooth flow without spilling. That’s how I remember iodised table salt entering our lives in the 80s. Fast forward to 2012. I was facing a few health issues - my blood pressure was going low, I was feeling giddy and nauseous especially in the evenings and I was drop dead tired all the time. Little did I know that all these issues was due to the wrong salt usage in my kitchen. My in-laws were staying with me around that time. Since both of them have diabetes and high BP, we had switched to “low-sodium” salt. Once I identified that this “salt” is the cause of my health issues, I stopped it immediately and my health situation improved a lot. My journey into researching more about salt began around that time. Salt is such an important ingredient in our food. It not only enhances the taste but also promotes salivation and digestion. Most of us use packaged "iodised table salt" in our daily cooking. In 1960s, salt iodisation programme was introduced in India when iodine deficiency disorder (IDD) was identified as the reason behind endemic goiter and mental retardation among children. In order to meet the growing demand for iodised salt, the Govt started to allow participation of private sector in 1983. 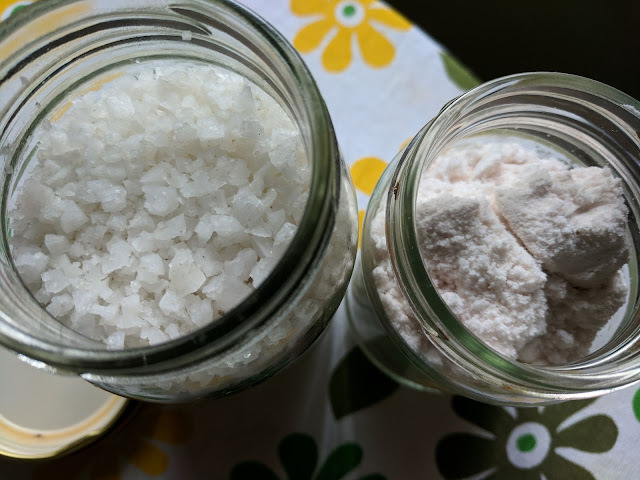 Iodised table salt is prepared by injecting a solution of potassium iodate onto sodium chloride along with anti-caking chemicals like Tri-calcium phosphate or Calcium Carbonate. In the last 20 years, people suffering from thyroid related disorders such as hyperthyroidism, hypothyroidism, goiter etc have increased. It is estimated that about 42 million people in India suffer from thyroid diseases. I’m sure there are many factors that can be attributed to this issue. But there seems to be a correlation (not concluding on causation yet) between the widespread use of iodised table salt and increase in thyroid related issues. Iodine both in excess or less quantity can adversely affect the functioning of thyroid glands and production of thyroid hormones. A Consumer Guidance note on iodised salt issued by FSSAI states that we require 150 micrograms of iodine per day, which we do not get in sufficient quantity from our diets and so iodised salt can help meet our 100% requirement. A gram of iodized salt contains 40 micrograms of iodine. 1 tsp of table salt equals 5.69 gms. So it means 1 tsp of iodised table salt contains 228 micrograms of iodine, which is 1.5X more than our daily requirement. If we also include our salt consumption through packaged junk foods (ketchup, chips, frozen snacks etc), then our iodine intake would be alarmingly high. Apart from iodised table salt, I wanted to understand the other food sources that are rich in iodine. I turned to my favourite source - Indian Foods Composition Table 2017. But I was disappointed to see that iodine quantity of foods wasn’t listed in this document. There was just this single line on iodine. Even though, the iodine content of 100 varieties of Indian foods was reported by Patnaik (1934) from NRL, Coonoor, they were not included in this edition of composition tables as the topic was so convoluted that it was considered outside the scope of the bulletin. I’ve been searching for this paper by Patnaik for the past one week but couldn’t get hold of it yet. From various other sources, I learned that Iodine is also found in seafoods, sea vegetables, dairy products (milk, yoghurt, cheese), bananas, strawberries, green leafy vegetables, onions, sweet potatoes, peanuts etc. My conclusion is that if you are eating a balanced diet, there is no need for iodized salt. I procure them from organic stores or native medicine stores (naattu marundhu kadai). I use the rock salt powder for dry sabzis, salads and soups. I use the sea salt for gravies like sambhar, rasam, dal etc. Sea salt (kal uppu in Tamil) increases the taste of any dish and the quantity required is very less too. Himalayan rock salt contains various minerals such as iodine, chromium, iron, magnesium, potassium and zinc. Salt by its very nature will form lumps when exposed to air. Adding artificial anti-caking agents do more harm than good. I’d rather prefer my salt to be healthy than “free flowing”. Whatever be the brand/type of salt you use, ensure the quantity you use is minimal (<1 tsp per day). AVOID all packaged, junk foods that are high on salt. P.S. If you have thyroid related issues, do check with your doctor before switching your salt.